Awa ower the Lammerlaw or North o’ the Tay? We’re a’ sure he’ll win back to Glesga the day. Come on noo an hear him – he’ll be ower thrang tae bide. Turn oot, Jock and Jimmie: leave your cranes and your muckle gantries. Great John MacLean’s comin’ back tae the Clyde. Aye, Great John MacLean’s comin’ back tae the Clyde. 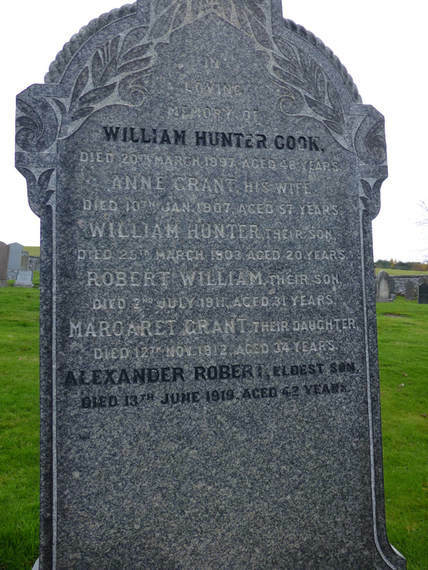 Alexander Robert Cook, buried in Stow, Selkirkshire. Alexander was a school teacher in the Shetlands. He appeared before a Military Service Tribunal in March 1916 for an exception to military service. The tribunal only granted him an exemption from combat and he was called up for the Non-Combatant Corps. Alexander refused and at the beginning of March 1917 he was arrested and handed over to the Military. The Army took him to Fort George where because he refused to put on a uniform he was court-martialed and sentenced to 112 days imprisonment in Wormwood Scrubs. He was then afforded the opportunity to participate in the Home Office Scheme, with consisted of forced manual labour on war-related projects in the UK, as well as construction and road building. He refused and was sentenced to serve with his unit again. He disobeyed any and all orders. This time his fate was to be imprisoned in the notorious Bar-L (Barlinnie Prison, Glasgow). Eventually released back to his unit through illness, he still refused to wear a uniform or obey orders and spent the remainder of his life in and out of hospital suffering from both physical and poor mental health. He died in Dykebar War Hospital, Paisley, on 13 June 1919. Peter is a researcher and blogs at The Great War (1914-18).